It's a dark and stormy night. With all the wind and rain outside, the old house you're trying to sleep in is making all sorts of noises. The doors rattle on their hinges with each boom of thunder. The shutters rattle on the windows (do people still shutter their windows?). And most of all, the rain thumps on the roof relentlessly. So when you heard that thump in the old nursery adjacent to your room you could have easily missed it. Instead, you heard it. There it was again. You could ignore it just tuck your head under the cover and hide. But what if it's something other than the storm or a cat or a mouse. What if it's something that woke up in the night? Something with dangerous intentions? This doll looks like it's straight out of a nightmare with its cracked porcelain texture facade. Its eyes glow bright red and it makes spooky noises to match. This doll runs on three AAA batteries so you'll be able to set it up anywhere you want for the scariest impact. 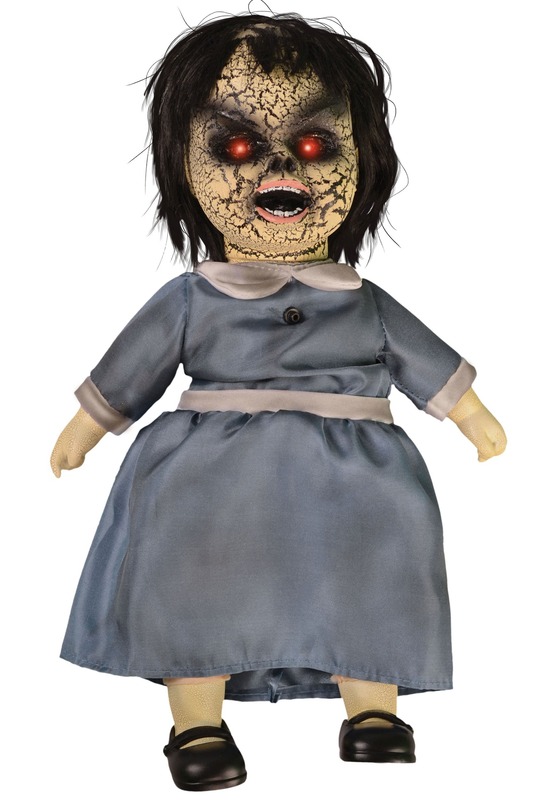 If you're hosting a spooky party this year, you'll have a great time with this doll! Just remember to set the scene. Plenty of old lace and candles will let people know they should get ready for some major creepiness. Oh, and one more thing, before you head to bed. . . remember to turn this little doll off! Sweet dreams!